Sunday (7/26) was a travel day. A pretty long travel day. I had estimated it would take two hours to load the van and it was actually closer to three, so I was tired before we started the driving bit. We were thankful that it was Sunday, as traffic through Indianapolis and Madison was not as heavy as it could have been. We chose to avoid Chicago altogether, though Google claimed that was the quickest route from Dayton, Ohio to Spring Green, Wisconsin. There’s not much else to say about the drive, except that the Wisconsin part was more scenic than the Indiana and Illinois parts. We stopped in Janesville, WI to get some fast-casual food (Noodles & Co.) and spotted a food market across the road. We decided to stop in and pick up a few things before heading to the campground a couple hours up the road. The store was one of Woodman’s Markets, which apparently have been in business since 1919 and employee-owned since 1998. It was quite extensive–nearly overwhelming. I had to bypass the cheese and cheese-spread aisle since Maureen and Rebbe were waiting in the car for me and I would have been there a long time. Fortunately, I did not spend too much, as one of the ways they keep costs down is through not accepting credit cards. We arrived at our campground near Lone Rock WI about 30 minutes before sunset. We were directed to our spacious site at the Fireside Campground by the owner and advised to scout out a path to the bathhouse before dark. We had barely enough time to get the tent set up before dark, so I didn’t heed this advice (Maureen did), which led to an interesting walk later that evening. Monday morning we had a pretty slow start. We were tired from the weekend’s activities and driving and not super-motivated to do anything or go anywhere. 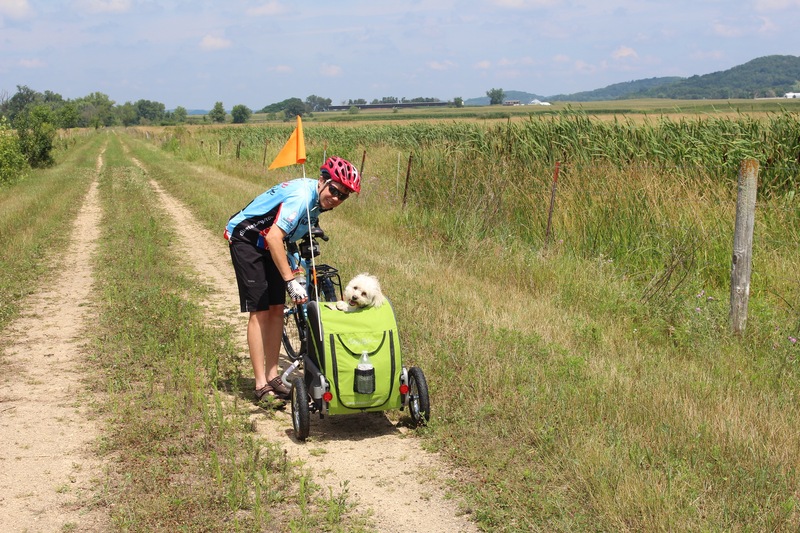 I had done some research on rail trails in southwestern Wisconsin, but the one that looked good (400 state trail) was about a 40-minute drive away. 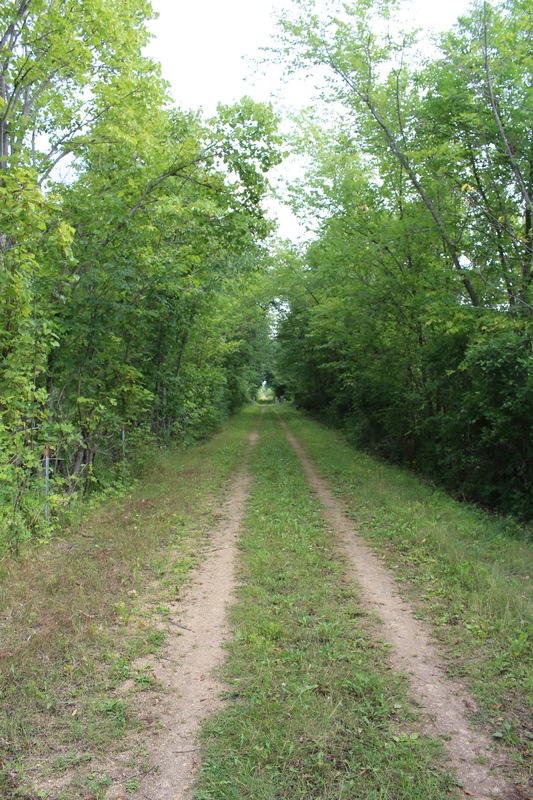 When we got the wireless going, I was able to find another rail trail (the Pine River trail) that was just across the main road (route 14) from the campground! So I installed the trailer hitch for Rebbe’s trailer, we prepped our bikes and ourselves and Rebbe, and off we went at 11:00 in the morning. The trail was almost all dirt and small gravel. It was eminently rideable on our wide touring tires, but slow going compared to riding on pavement. We knew the ride back would be hot, so we just took an easy pace and stopped every few miles to drink and take some photos. 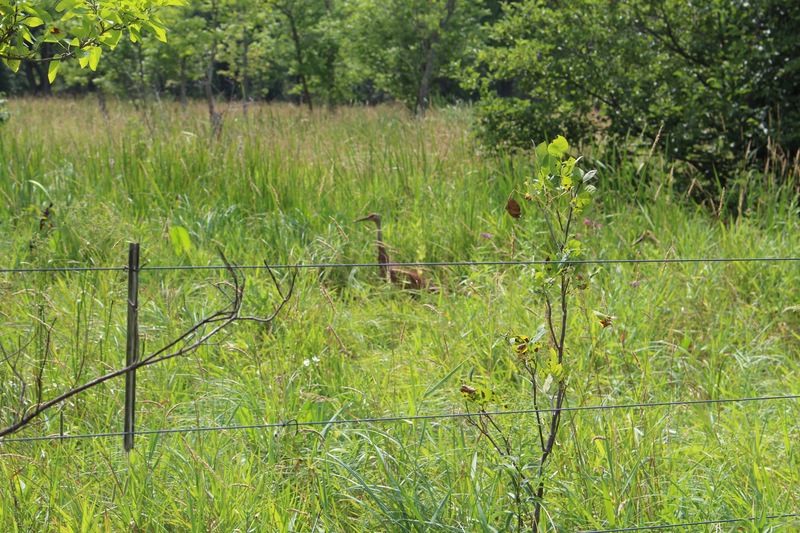 We had an unplanned stop when I spotted these two Sandhill Cranes in the field right next to us. 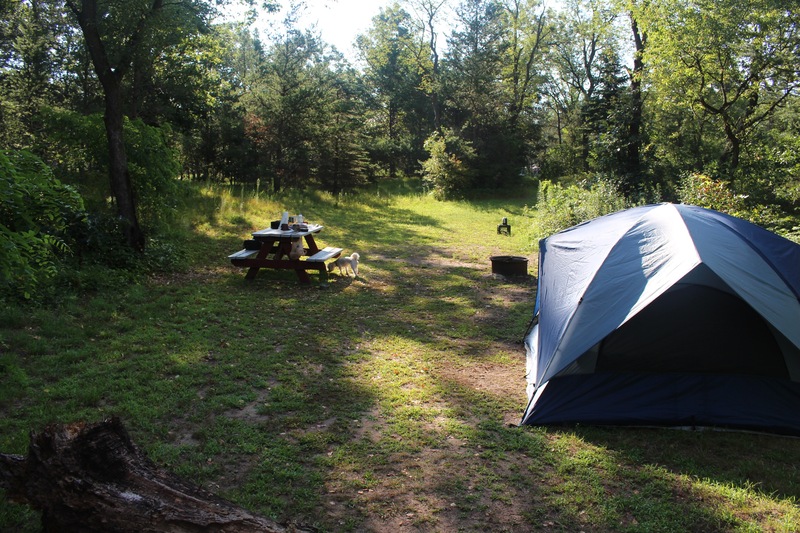 We were pretty spent when we got back to camp, so we relaxed and enjoyed some happy hour beverages, as well as the showers at the well-equipped and friendly Fireside Campground. A simple dinner completed our day, and we turned in early to rest up for our tour of Taliesin on Tuesday. Nice pictures. That’s a bike path? Kinda like the trail from Cumberland to DC. And like much of what we rode in England. Hard riding, but Rebbe was calmer than usual.